Shouldering too heavy a load, especially in tasks that have nothing to do with teaching, is a common concern of teachers - one that has made many leave the profession. Work begins as early as 7am, and does not end when the last bell rings. According to some educators, more than half of their 12-hour day is spent on other duties such as organising school events and workshops for students. About 5,000 teachers have left the teaching force over the last five years, though for other reasons as well, such as family or wanting a change of job. 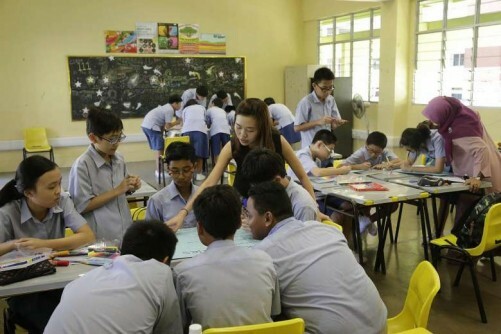 Still, the complaint has plagued the teaching service for years, and is one the Education Ministry (MOE) is taking steps to address, though it notes the annual resignation rate has "remained low at around 3 per cent" in the last five years. The teaching force of more than 33,000 officers has remained stable, it says. Nonetheless, the resignation rate has gone up from 2 per cent, or 400 to 500 resignations a year, a figure disclosed by MOE in 2000, when the teaching force numbered around 23,000. A story this week about the resignations prompted a slew of reactions, with some teachers taking to social media to voice their woes, like having to handle demanding principals and difficult parents. A teacher guiding the students in her class. For a country that boasts a world-class education system, it is time to pay more attention to our teachers. Many who left might have stayed with a lighter load. Some teachers have suggested outsourcing tasks like event organisation, and reducing the amount of grading, so they can focus on teaching. The MOE has responded, on some fronts. Schools have been looking at ways to help teachers. The ministry appears not to be too worried, for now, by the attrition, but it is something to watch. After all, teachers are the linchpin of the education system and many are called to the vocation. One said: "Sometimes, we sacrifice at our end so that their (the students') lives can be more fulfilled." Teaching is indeed a noble profession, and it should not become a thankless job.